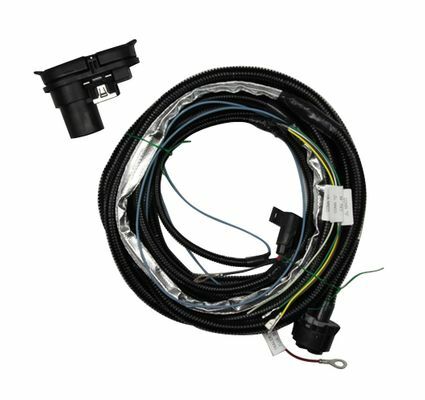 7-Way Trailer Tow Wiring Harness for 2011-13 WK2 Grand Cherokee models. All 2014 Grand Cherokees already have wiring installed and just require Factory Hitch Connector Item # 56055632AC for proper hitch installation. That guy said it all. After all that you have to get it activated at a dealership to work. The quality of the cable and connectors is very good. Installation wasn't too hard, but it did get pretty confusing when it came time to take the TIPM (the main fuse/relay area in the engine compartment). You have to look very carefully at the labeling on the plastic to be sure you're taking out the right plug. Also, those plugs are hard to remove and the instructions give no clues on how to extract them. One of the plugs just required inserting a new wire into it (and making a solder connection to an existing wire). The other plug though, required busting out a plate cover on the back of the plug, when in turn requires you to take the plug apart to get the bits of plastic back out. Maybe there's a better way to do it, but with over 25 years of electronics experience, I couldn't figure it out. Routing wasn't hard, but the instructions aren't very clear how you're *supposed* to route it. I got it in place using some educated guesses, and I think it will be fine. Just be sure that you get all of the plugs back in place AND FULLY SEATED. The first time I put my TIPM back together, the Jeep wouldn't start and was flashing some random error messages when it tried. I took it all back apart and found one of the plugs (the brown one) was only half-seated. Also, in hind-sight, I probably would have installed the cable through the underside of the Jeep BEFORE I wired it into the TIPM. I think it would have been easier to judge lengths and how much slack to leave. ProsQuality components, and instructions were fairly complete, considering the complexity of the wiring changes. I also like that it comes with the 7-pin round AND 4-pin flat connectors, so no more adapters. ConsThe instructions were confusing on the TIPM wiring. HINT: They don't necessarily point to the plug that they're actually referring to in the text.